In the Single Parents universe, Joust seems to be their version of Game of Thrones, though I feel like Game of Thrones exists in this world too but I digress. Will and Angie are major Joust fans and they plan an epic binge tournament to prepare for the next season's premiere. Both of them are single and somewhat miserable because of it. 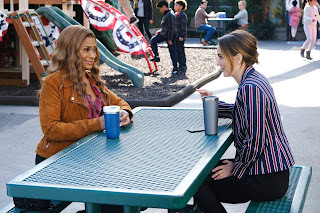 Angie is still stress crying (and eating) post-break up with Owen and Will is upset about finding out Tracy actually has a boyfriend. These binge nights are keeping them both afloat. At least they are until Tracy shows up at Will's doorstep echoing the same sentiment he did to her. She broke up with Jeremy on a whim and wants to turn her sizzling toaster chemistry with Will into an actual relationship! Will is ecstatic and they begin dating, while Angie remains left in the dust. She can't help but get a little jealous about Will's new relationship, the fact he's ditching their Joust tournament and maybe because she has feelings for him too? Rory is attempting to run for class president against annual winner, Bunny Ears. He enlists the twins and Poppy's help, which, by extension, also ropes in Douglas. At first, Douglas is against getting involved in the election but all that changes when Bunny Ears starts a smear campaign and his daughters are caught up in it. Douglas throws himself into poster-making and glitter glue to aide in Rory's campaign. And also because he likes spending time with Poppy! We finally get to the next step in the Douglas/Poppy relationship as they share a KISS! I squealed at the television. Neither of them know what to do about said kiss at the moment. I don't foresee them getting into an immediate relationship because Single Parents is clearly enjoying the slow-burn (and so am I). But it was still an incredibly cute scene. Though a short-lived one as Poppy finds out Douglas was responsible for getting Bunny Ears to drop out of the race in exchange for a $600 dollar scooter. Poppy wants Rory to win on his own merit, not just because he's the only option left. She gets Bunny Ears to re-enter and Rory does win, of his own accord! Though he then proceeds to ban elections forever and makes everyone bow... Poppy and Douglas lament they may have made a mistake. Remember Bobbi Lee from a few weeks ago? Well she is still in the picture as Miggy's new girlfriend. The problem is, she doesn't actually like Miggy for Miggy. Instead, she wants him dressed like a mannequin in a pro golf shop, make him a fan of clams, and get his tattoos removed. Basically, Bobbi Lee wants to change everything about Miggy that makes him, well, Miggy. Graham and Sophie point this out to him as he wears clothes she picked out and asks Sophie to teach him about clam bakes but he's happy with Bobbi Lee and wants to make her happy. Ultimately however, when Bobbi Lee requests Miggy get his tattoos removed permanently he realizes she doesn't actually like him for him and only for her idea of what he could be. They break up and Miggy gets to be back to his good ol' lovable self. Angie: Do you have any red wine that's even redder? Like, more the color of the blood of The Sacred Ox? Poppy: Okay, what's happening here? Is this a cult thing? If it's a moon cult, I'm in. I love moon stuff. Sophie: Well, you're in luck. I know everything about clam bakes. My American Girl doll, Tinsley, summers in Nantucket. Poppy: We can do this later. Douglas: I don't want to go. I want to be with you. Miggy: I enjoy every odd-numbered installment of the "Fast and the Furious" franchise, #JusticeForHan. 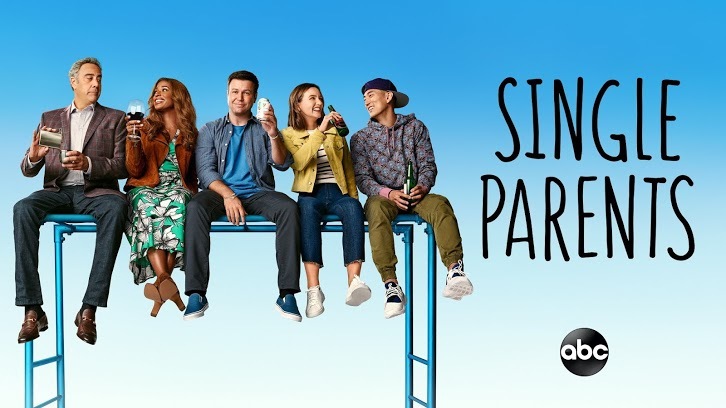 New episodes of Single Parents premiere Wednesday nights on ABC.